I started writing in the fourth grade. I wasn’t what most would call an “average” student. I had a tendency to become bored in class, mostly because I finished my work before most of the other students. I was often more than a handful for some of the teachers, my fourth grade teacher in particular. She couldn’t handle me and there was a whole situation with the faculty and my parents. It was a mess. They couldn’t find a classroom to put me in because most of the teachers didn’t want an extra student/didn’t have enough room. It was at this time that I requested a specific teacher, Mrs. Becker. I specifically requested Mrs. Becker because I had her for reading class and I think she was one of the few teachers who actually worked with me. And not just me, but her students in general. She knew from her years of experience that every student was different and didn’t respond the same to a specific lesson plan. She had nothing but patience and respect for every student who walked through her door. And she also taught us about respect and patience. She didn’t tolerate anything less than what we were capable of. When Mrs. Becker heard about the problem, she was shocked that I was having trouble – because she had never had an issue with me and knew what I as capable of. She allowed them to place me in her class, despite the fact that she already had over the recommended amount of students. During that year, Mrs. Becker helped me discover my love of writing, and encouraged it. Fast forward to middle school. I started writing poetry and short stories. I would read books like Harry Potter, Chronicles of Narnia, A Series of Unfortunate Events, etc. I kept reading and no matter how many books I devoured, my hunger was insatiable. I didn’t know it then, but I know now that I was living vicariously through those authors. I wanted so badly for my novels to be on the same shelves as my favorite authors one day. From seventh grade to high school, things got rough. So many things hit me at once…it was like a domino effect. I was struggling with my sexuality, I had no friends, and I was bullied. It was also during this time that my anxiety surfaced. I would have to rush out of classes and I had panic attacks in the bathroom/nurse’s office. Sometimes I would throw up because of the stress. And at home there were times where I would close my eyes at night and hope that I didn’t wake up in the morning. Eventually I came to the realization that I couldn’t go to school anymore. I continued my studying online and devoted most of my time to writing. I would write short stories about characters who were brave, strong, and confident…basically all things that I wanted so badly to be. I just didn’t know if I had it in me. Spoiler: I did. It was around my sixteenth birthday when I decided to start writing my first novel. It was about a team of young superheroes who were tasked with the important job of saving the world. The Descending Darkness. The more immersed in their world I became, the more I realized that I was writing about myself. I felt like the world was on my shoulders and I felt like it was being taken over by darkness. And more often than not, I felt like the darkness would never subside. I didn’t ever consider the fact that I would be able to save myself and survive it. And with that realization came strength, but more importantly, knowledge. I knew that there was a happy ending for me if I just had hope and the courage to fight. And that’s exactly what I did. Presently, things are much better than they once were. I’ve learned better ways to deal with my anxiety/depression. It’s not completely better and I doubt it will ever be, but I have an amazing support system and an awesome outlet – writing. I’ve been engaged to the same wonderful person for four years. 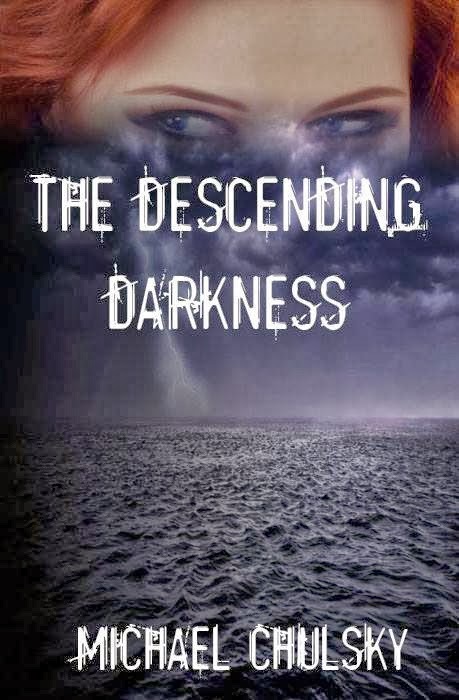 And this year my debut novel, The Descending Darkness was published. I geared it more towards teenagers/young adults so they know not to give up. I want them to have characters they can relate to/ and a world they can find solace in. I want them to always believe that there’s something better in the future. Never stop fighting the darkness. Michael Chulsky grew up in New Jersey and has been writing ever since his fourth grade teacher let him create a class newspaper to channel his creativity. He is the author of The Descending Darkness and currently lives with his fiancé. When not writing he enjoys browsing Tumblr, listening to music, and devouring every piece of cheesecake that falls into his line of sight. After going from demon hunter to babysitter, seventeen-year-old SHADOW has truly hit rock bottom. One week he’s slaughtering demons, and the next he has ten super-powered teenagers in his care. Shadow needs them, because without them he can’t hope to defeat his new foe. But he’s never dealt with other teenagers before. He never had a real childhood. He’s always been a loner. Hell, he’s tried the whole having-a-pet-thing. It died. Shadow’s mission: save the world and ensure his team survives the potential apocalypse. If MAEDARA, self-proclaimed fashionista and Queen of Evil, wasn’t trying to rule the world, it’d be cake. Now, not only does Shadow have to deal with teens more concerned with going to the mall than fighting evil, but also a villain, who, in his opinion, makes Lady Gaga look like Mother Theresa. David, you have been a wonderful host all week, thank you so much! Michael, I love your attitude. You overcame many obstacles and made the best of them and are now helping other teens. I admire you for that. Good luck with your rafflecopter! Michael, best of luck to you!